Did you know that Hawaii is home to 80% of coral reefs within the United States? It’s true! And those coral reefs provide the world – that’s right, the WORLD! 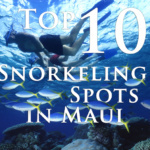 – with beautiful snorkeling spots, fresh fish, clean water, medicine and even oxygen. Therefore, it’s very important that we all do our part to come together and help preserve Hawaii’s coral reefs. You may be saying to yourself, “I’m an office worker who doesn’t go to the beach very often. And I don’t live on Maui. Why should I care?” Coral reefs are vital to everyone — not just the marine life who inhabit it and not just the people who are in Hawaii. Read below to learn why you should care and how you can help – wherever you are. Understand that coral reefs, which act as natural barriers to coastlines, are the basis for an entire community of plants and animals in their environment. In other words, an ecosystem! Once a coral reef dies, the ecosystem that is built upon it will collapse as the creatures that inhabit it die or leave. In addition to supporting rich, diverse ecosystems that are home to about a fourth of all identified marine life and acting as a protective barrier to coastlines, coral reefs are invaluable from a medical standpoint. Known as the medicine chests of the sea, many of its marine creatures produce compounds that are used for human application, including the treatment of leukemia. for creating between 70-80% of the oxygen in our atmosphere? Because many of us learned in school that oxygen comes from plants, like trees and bushes, this statistic may be surprising at first. However, it stands to reason when you consider that the ocean covers 71% of the earth! To sum it up, coral reefs are invaluable. They support numerous industries ranging from medical to tourism and provide us with most of the air we breathe – no matter where we are! We have an obligation to make sure that the beauty and resources that coral reefs provide are available for future generations. As written about in the National Geographic, Huffington Post, and Washington Post, among other notable publications, common ingredients in sunscreen, like oxybenzone, causes damage to coral reefs. As reported by the Washington Post, “measurements of oxybenzone in seawater within coral reefs in Hawaii and the U.S. Virgin Islands found concentrations ranging from 800 parts per trillion to 1.4 parts per million.” According to the article, that concentration is 12 times higher than what is needed to harm coral! Skincare is, of course, important. Especially with the knowledge we have regarding skin cancer. An ounce of prevention is worth a pound of cure and that saying is applicable to both protecting your skin and Hawaii’s reefs. When choosing your sunscreen, it’s important to make sure that it is “reef safe.” You can do this by checking the active ingredients list for titanium dioxide and zinc oxide as the active ingredients. One of our favorite reef safe sunscreens is Hawaiian Sol, which is not only organic but also made locally. Additionally, by wearing long-sleeved clothing or clothing that covers more of your skin, you lessen the amount of sunscreen that you need to use. There are also clothing that offers UV protection that ranges between 45+ and 100+ SPF. Retailers, like Target and Costco, often have these items for sale during the summer. As awareness about harmful chemicals in sunscreen spreads, there have been multiple bills introduced to help solve the issue at hand. Nathan Eagle of Civil Beat.org wrote an informative article titled, “Efforts Underway To Rid Hawaii of Coral-Damaging Sunscreen,” which touches upon two of them: SB210 and SB260. HB600 Bans the sale, offer for sale, or distribution for sale of sunscreen or personal care products containing oxybenzone. Effective July 1, 2018, HB818 Requires advertisements or displays for sunscreens containing oxybenzone in the state to include a conspicuously displayed statement that the use of oxybenzone in nearshore waters poses serious hazards to coral and reef health. HB819 Prohibits the sale, offering for sale, or distribution of any sunscreen containing oxybenzone in the State unless the sunscreen label contains a warning that the use of oxybenzone in nearshore waters poses serious hazards to coral and reef health. SB210 Prohibits the use or application of sunscreen or sunblock containing oxybenzone or cosmetics with sunscreen containing oxybenzone while on a beach. SB260 Bans knowingly selling in the state personal care products containing oxybenzone or octinoxate, except for medically-licensed prescriptions. Takes effect on 10/1/2017. Referring back to item #6 Encourage Politicians to Act, we also encourage you to support petitions, like this one, which asks to ban the sale of coral-damaging sunscreen in Hawaii. Every action you take makes a difference, whether it is donating your time or money to organizations, signing petitions, or contacting members of the government. As the saying goes, “even a ripple might become a wave,” and we can use that momentum for the greater good. * Clicking the link “contact local Representatives” will take you to a page with information on Hawaii Representatives including the districts they represent and their e-mail addresses. ** Clicking the link “members of Senate” will take you to the website for the application Countable. Countable makes reading Bills easy to understand and allows you to tell lawmakers whether they should vote “yea” or “nay” on the issues that are important to you. The app is available for free through the Google Play Store and the Apple App Store. Why parrotfish? Known in the scientific community as the lawn mowers of the reefs, parrotfish spend up to 90% of their day eating the algae that grows on and smothers coral. They also help by replenishing sand and keeping beaches, well … sandy. Studies show that a large individual parrotfish in Hawaii can poop out over 1 ton of sand annually! Fisherman can save parrotfish by being pono (moral) fishers, and, as an extension of that, follow laws in place that are meant to prevent overfishing. Too often overzealous spearfishers go after parrotfish because they are easy to catch at night while they are asleep. Reef safe and certified eco-tour companies, resorts, and hotels make choices that are best for the environment, from providing reef safe sunscreen to participating in the statewide reef stewardship project. By supporting reef safe businesses, you are promoting sustainable tourism and encouraging other businesses to adopt an environmentally friendly model. Hopefully, one day, there will be no need for the distinction between an environmentally friendly business and one that is not, as being environmentally friendly becomes the standard. The Maui Nui Marine Resource Council is a volunteer based non-profit whose vision is to have clean coastal waters and an abundance of native fish on healthy coral reefs. MNMRC’s “Maui Coral Reef Recovery Plan” guides their daily efforts to improve water quality and reduce the decline of coral reef health. 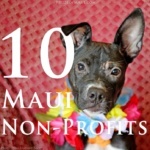 To volunteer, participate or support their efforts, please visit: info@mauireefs.org. The Maui Nui Marine Resource Council supports Polanui Hiu as a fiscal sponsor. What is Polanui Hiu? Polanui Hiu is a group comprised of members of the local community who are concerned about the decline in marine resources and are working toward restoring resources and traditions that were practiced in the past. 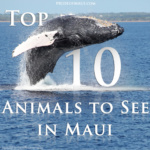 The Oceanwide Science Institute, a non-profit based on the island of Maui, is a group of academics and professionals with expertise in the study of sound in the marine environment. They help communities locally and globally understand marine ecosystems through unbiased science and education. When you donate to OSI, 100% of your donation goes towards research. A 4-star rated charity (as rated by Charity Navigator), the Coral Reef Alliance leads holistic conservation programs and works with people from all around the world. Donations to this charity can be made in honor or memory of a loved one. University of Hawaii’s Coral Reef Ecology Lab is overseen by one of our favorite researchers, Ku’ulei Rodgers, Ph.D, which she has been a part of since 1993. 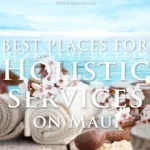 Maui Cultural Lands is a grass-roots non-profit founded on the principles of traditional Hawaiian values and dedicated to the conservation of Hawaiian cultural resources through the reforestation of native flora to Honokowai Valley and the Kaanapali area. They are also dedicated to the archeological stabilization of Honokowai Valley and provide educational opportunities for the Hawaiian community and general public. Whether you support regulations for clean water, have reservations about construction as it affects the environment, or have concerns about fishing at national, state, or local levels, it is important to make an effort to have your voice heard. It is up to you whether that means calling or sending a well-written letter to your local politician’s office or signing a petition. With the advent of social media it has become increasingly easy to keep our fingers on the pulse of what is going on in the world and, in becoming more connected, we are able to do more to help. Currently, there is an online petition on Change.org started by Marine Scientist, Dr. Mark Deakos, who is a part of the Maui Nui Marine Resource Council and the Executive Director of Hawaii Association for Marine Education and Research, to put a moratorium on seawalls built along the Olowalu coastline to prevent the destruction of beaches, coral reefs, and coastal habitats for vulnerable marine species. To say that watersheds are important would be an understatement. Why are watersheds important? To put it simply, they are required to support life for plants, animals, and humans. Watersheds provide drinking water, protect oceans, mitigate flooding, and support the economy–and those are just several of the amazing purposes that watersheds serve. There are two watersheds on Maui: the West Maui Mountains Watershed and the East Maui Mountains Watershed. The West Maui Mountains Watershed offers both volunteer opportunities and accepts donations while the East Maui Watershed has an Adopt-a-Fence Program that assists them with costs related to upkeep. In terms of value, watersheds are priceless, so the time and money spent on their upkeep are more than well worth it. Your time is a precious gift that you can give at no cost to help the environment! Whenever you’re at the beach, you can do your part by leaving only footprints, as the saying goes. Take your trash with you and if you happen to see any trash that isn’t yours, pick it up and dispose of it properly. If you’re looking to be a part of a larger movement, the Maui Nui Marine Resource Council is always looking for volunteers for projects, like beach cleanings or assisting in assessing water quality. Another great way to volunteer your time is with Maui Cultural Lands in helping them preserve Maui’s land trusts, such as the Honokowai Valley. Their primary goal is to reforest parts of Maui with native and endemic Hawaiian plant species. What’s done on the land and around the water of the valleys directly influences what runs into the ocean and into the reefs. By living sustainably you can reduce your carbon footprint and help reverse the effects of global warming. Small, everyday choices like recycling or using reusable bags instead of plastic ones might not seem like much, but changes to your daily life can have a huge impact on the environment. In addition to following the three R’s (reducing, reusing and recycling), you can also help the environment by composting biodegradable waste in your garden, purchasing sustainable seafood, avoid purchasing items that are made from coral or other marine life, conserve water, and become an advocate for reef conservation! According to NOAA’s Marine Debris Program, plastic litter and other debris that makes its way into the ocean can have devastating effects on coral reefs. Not only do these plastics damage the reefs by falling on them and getting stuck inside the coral, they can also carry invasive species that can travel hundreds of miles and harm local ecosystems. By keeping plastic debris and other litter — bottles, drinking straws, diapers, carry-out food containers, cans, fishing line, etc. 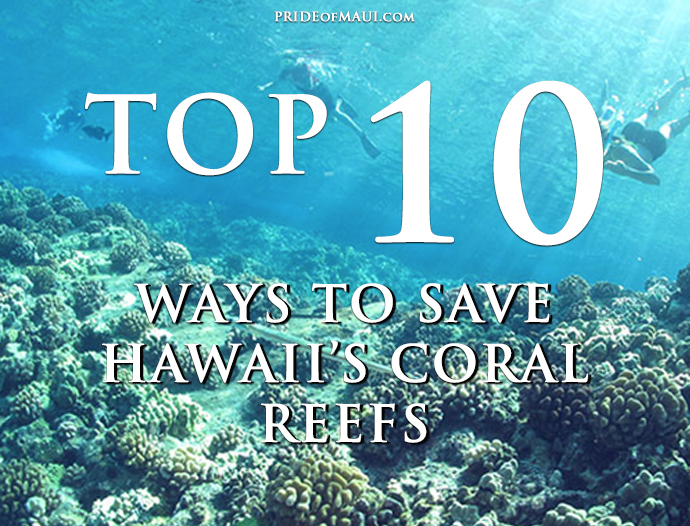 — off the beaches and out of the ocean, you can do your part and help save Hawaii’s coral reefs!